The Artesian Spas Company has been manufacturing hot tubs in Las Vegas since 1992. They make several different series of spas and sell them worldwide. Their high end line is called the Platinum Elite series. Their mid-range line is called the Island Spa series. 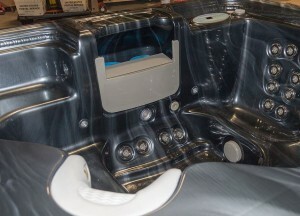 Their economical line of hot tubs is call the South Seas Spa series. All hot tubs are made up of a large number of components. Many of the components are purchased from part manufactures that specialize in a certain area. For instance, most of the controls in Artesian Spas are made by either Balboa or Gecko. Filters made be made by Pleatco, RJ or Unicel. Pumps may come from Ultimax, etc. So how do you find the correct Artesian Spa parts online for your model of hot tub? 1. Most equipment (heaters, blowers, spa pumps) will have labels that give you all the specs you need to buy the correct replacement. This information generally includes the horsepower rating, frame size, voltage, connection size, etc. 2. Filters will often have a stamp on the plastic housing. As long as the filter is the same size, it does not necessarily have to be the same brand. You can often save money buying replacement spa filters that are less well-known. If there is no stamp on the filter, you can use the handy filter measuring guide at: https://www.hottuboutpost.com/how-measure-spa-filters. 3. Spa pillows will vary according to spa model. You will want to note the shape, size and color – then try to match it with the replacement pillows listed online. 4. Jets will vary by spa as well. First, you need to know the size of a jet and the color (stainless steel, white, grey, etc.) There are many types of jets including turbo, typhoon, directional, rotational, air injectors, etc. 5. Artesian spa control panels will vary by model and series. It is important to match the number of buttons and placement of the LED screen. 7. Spa ozone generators generally need to be replaced every 2 years or so. If you are not sure if your ozonator is working, invest in an easy-to-use ozone testing kit. There are many other components and accessories that are suitable for all spas, including Artesian. These include water test kits, chemicals, aromatherapy fragrances, LED lights, cleaning tools and spa steps. It is best to order all needed items as once, since Hot Tub Outpost offers free shipping in the continental USA for orders over $95. Finding your Artesian Spa parts online can save you both time and money. Happy hot tubbing!